Today's topic: Trampas asks a question about the "Left Behind" series, mostly about the quality of the writing, and why are so many people still rushing to read them all? Mike and Mike posit that it's the apparent lack of modern Christian-based or Christian-themed fiction out in the marketplace, and the word-of-mouth marketing efforts of book clubs, combined with a smaller number of writers in that genre. Discuss. 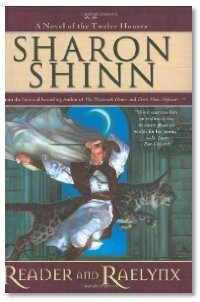 Listener Review: Web Genii gives us a review of Reader and Raelynx by Sharon Shinn, the fourth book in her Twelve Houses series. Spoilers are contained within, so listen at your own risk! The Library: This week's new books: The Houses of Time by Jamil Nasir; ELOM by William H. Drinkard; The Hidden World by Paul Park; The Born Queen by Greg Keyes; A World Too Near by Kay Kenyon; Lady and the Vamp by Michelle Rowen. Left behind isnt sold as 'fiction' as the writers appeal to the audience that believes this event is imminent and reactionary. Its sold more as tom Clancy's novels are...'worst cases' scenarios that posit a very upfront ideology that either caused the event or that can solve it(in some cases both). As far as christian literature is concerned, its massive in terms of sales potential. But the networks are not as clear to New York book-makers/sellers because it is not concentrated in regular store outlets. What is not massive is the ability for visible 'cross-over' appeals in sections not considered appropriate by the shoppers themselves. The was one book i had read years ago that was certainly written for christian readership but could easily fit into the mystery section of any book store. It was a story about a roman legionaire charge by the senate to investigate charges of brutality by pontius pilot after a string of Hebrew religious figures had been executed. Including wandering rabbi called Jesus. Those sections in the stores divided by the names seem to be a help for the buyer, but so great for writer...i think the dynamic shone by Amazon's system of recommendation will translate eventually into physical space somehow. Thus a everyday Christians that love hard science fiction will be able to find authors that easily appeal to one without grossly insulting the other. - Most of Gene Wolfe's stuff, though it can be rather oblique. I've read half the "Left Behind" series--before the entire series was available. Maybe some day I'll finish it. I'm highly selective and critical of the books I read and, while I would consider the Left Behind books to be fairly low on the excellence of writing scale, they are still good reads. In fact, they get better as you progress into the series. However, I can see how non-Christians would not be entertained by the subject matter. I read extensively in fantasy, romance and occasionally sci fi genres and rarely Christian fic, even though I'd be considered a Bible-thumper by most of the C2C crowd. While I've read some very good fiction sold as Christian fic, there is a lot of pretty bad stuff out there too. Maybe Christian publishers can't be as selective as other genre publishers, but then again, there is plenty of trash in every genre. I certainly don't see anything wrong with Christians writing fiction in mainstream genres. I firmly believe that all writers write their worldview, and hence this means that all books have some kind of religious bias, whether it be Christian, atheism or some other religion. I don't like preachy books any more than the next reader, and, from my experience, a book doesn't have to be Christian to be preachy. We vote by what we read, and there definitely isn't any reason to restrict certain worldviews from any of the available genres if people buy them and read them.